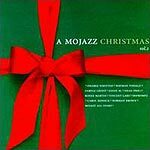 CD review: "A MoJazz Christmas, Vol. 2"
This is nice, pleasant easy-listening R&B/jazz in a Kenny G vein. All the old faves are here  "Winter Wonderland," "O Come All Ye Faithful," "Jingle Bells." All are performed with an appropriate nod to tradition and a danceable backbeat for the '90s. The artists on this compilation include Wayman Tisdale, Norman Brown and Pharez Whitted. Nothing to really grab you here, but some very nice unintrusive background music for the holidays.